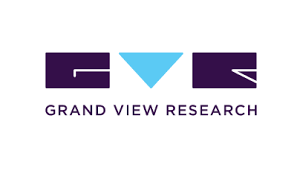 Engineering Adhesives Market Poised To Cross $22.12 Billion By 2022: Grand View Research, Inc.
San Francisco, United States, 2018-Aug-21 — /EPR Network/ —The global engineering adhesives market is expected to reach USD 22.12 billion by 2022, according to a new report by Grand View Research, Inc. Increasing demand for high strength and rigid bonding adhesion products from key end-use industries such as consumer goods, construction and transportation is expected to remain a key driving factor for global engineering adhesives market. The most rapid advances are likely to be achieved in reactive and hot melt adhesives, owing to expanding manufacturing and construction sectors particularly in rapidly expanding economies, which is expected to foster demand for polymers and artificially fabricated components. Lack of VOC (volatile organic compounds) in hot melts and water-based formulations is a key factor for shaping industry growth. The global industry is governed by regulations established by various agencies and legislatures such as U.S. EPA, RoHS Directive in UK, U.S. FDA, ECHA and Green Chemistry Act. These regulations have been instrumental in development of bio-based adhesive formulations that are also critical for market development. Epoxies were the leading product segment and accounted for 36.4% of total market volume in 2014. Increasing regulations for curbing overall vehicle weight in order to improve fuel efficiency is expected to drive this segment over the forecast period. 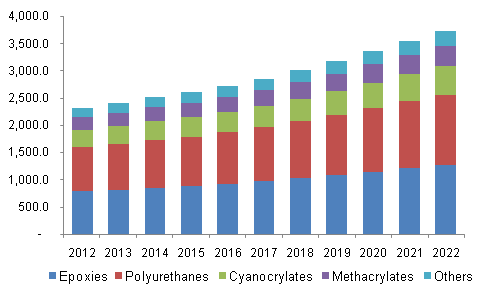 Methacrylates are expected to witness the highest growth of 6.2% from 2015 to 2022. Global engineering adhesives market size was 4.55 million tons in 2014 and is expected to reach 7.06 million tons by 2022, growing at a CAGR of 5.8% from 2015 to 2022. Construction was the leading application segment and accounted for 32.5% of total market volume in 2014. Increasing construction spending in Asia Pacific is expected to remain a key driving factor for this segment over the forecast period. Transportation is expected to witness the highest growth of 6.1% from 2015 to 2022. Asia Pacific was the leading regional market with demand share exceeding 40% in 2014. Positive outlook on automotive industry coupled with increasing construction spending particularly in India, China, Indonesia, Thailand and Vietnam is expected to drive the regional growth over the forecast period. Asia Pacific is also expected to witness the highest growth of 7.6% from 2015 to 2022. The global engineering adhesives market share is dominated by large integrated companies that are also involved in polymer resin manufacturing, and specialty chemicals production. Key companies with global presence include Huntsman Corporation, 3M Company, Franklin International, Permabond Engineering Adhesives, Henkel, Toray Fine Chemicals and W.I. Polymers Ltd.